Happy Chinese and Lunar New Year! It’s coming up on February 8th, for those of you not following the lunar calendar. And, how exciting, it’s Year of the Monkey! Not that this is any more or less exciting than other years, but it’s a good one. If you’ve known us for any length of time, you’ll know that we’re Chinese, but we’re kind of a mix of “Chinese-Chinese” and “Canadian-Chinese” (unfortunately mostly leaning towards the “Canadian-Chinese” side of things), but Chinese New Year is a pretty big deal in the motherland, and so we thought we would celebrate a bit with you all! 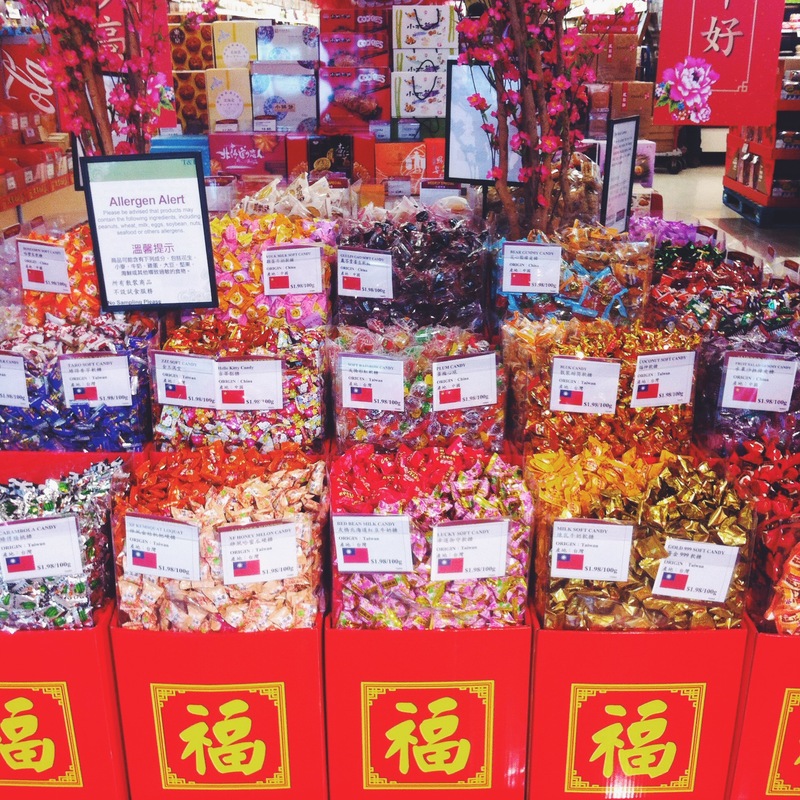 Everyone’s favourite Chinese supermarket, T&T, has these displays of Chinese New Year decorations, festive treats and …candies! From now until we run out or until February 8th (after which I’ll eat the rest), we’re including a special surprise CNY candy with all online orders, or of course you can always visit us in the shop and pick out a tasty CNY treat for yourself. T&T put up these big signs saying that there’s a risk of peanut, soy, milk, and other allergies with these candies, so I’m passing on the message. While I tried to get a good variety of candies, I left out the ones that were a bit obvious about potential allergy problems, like the ones with the picture of the peanut on the wrapper (I did teach in public school, after all). However, you should still use your best judgement, and be careful if you have any allergies. 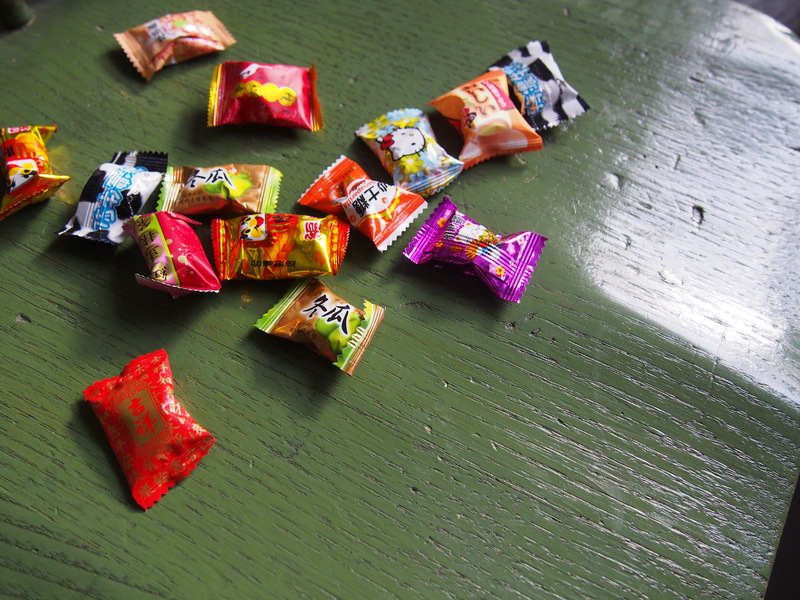 Possibly even more dangerous is the taste roulette you play with these candies: there are so many different kinds it’s hard to keep track of them, and I must say, while some are pretty delicious, some may be an unusual “flavour”… all part of the surprise! My favourite ones are the coffee ones and also the mango ones. The pear ones are also pretty good. I also got a red decoration, which we haven’t decided where to hang up yet. I was going to get one in the shape of a monkey, but Jon said I shouldn’t go too crazy, because then I’ll have to store it for twelve years, and chances are good when the next Year of the Monkey rolls around I won’t be able to find it, so it’ll be another twelve years after that. If you’re a letter writer, you might also be pleased to know that Canada Post has come out with it’s new Year of the Monkey stamps! I told Jon I was going to ease off on the stamp hoarding after we took that trip to the Toronto Stamp Show last fall, and I brought home boxes of stamps, but how can I resist. The international ones look a bit intense, but I’m loving the domestic ones! So, as traditional holds (according to Wikipedia), we will be eating dumplings at midnight on February 7th, and wishing you all a very prosperous, lucky and happy Chinese New year! Wishing I had a day off but that is not the case so I’ll have to settle for celebrating at midnight as well. I guess I’ll be stopping by soon (purely for the candy, of course). P.S. Are Kaweco Skyline Sport in mint, extra fine in stock?